F. Whisten asks: Is it true that all clams are male? If so, how do they reproduce? Encased in a hard shell, brainless and possessing only a single limb (a retractable foot that looks like a tongue), clams seem like a species for which reproduction would be difficult. And yet, each year, millions of clams are born – thanks in large part to chance. 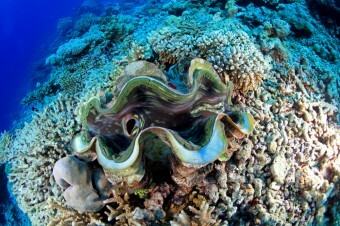 During their life cycles, clams go through several stages before they look and act like a clam as we think of it. When they reach this juvenile stage, all clams are male – this works out because clam sperm is much smaller and takes less resources to produce than clam eggs. The juvenile males simply couldn’t accommodate eggs, nor have the metabolic resources required to be able to produce them. When they become adults and can devote more energy to reproduction, rather than growing, this ceases to be an issue. In any event, clams begin making babies when the water gets sufficiently warm, depending on the location and the species, in the spring, summer or fall. For the Northern Quahog Clam (sometime called the hard clam or Mercenaria mercenaria), this happens in late spring/early summer when the water reaches about 68F. Called spawning, at the appointed time, the smaller males release sperm into the ocean to (hopefully) meet up with the eggs produced by the larger (and older) clams that have become females. These millions of gametes join in the water where fertilization occurs. When a sperm and egg do manage to meet, the cells of each young egg rapidly divide until the embryo grows into a morula, a ball of cells that resembles a mulberry (hence the name). After a day or two, cilia grow on the creature, which again develops into a trocophore, a free-swimming larva. Continuing to change, the larva adds a shell and a foot and becomes a veliger that spends the next couple of weeks swimming around eating plankton. 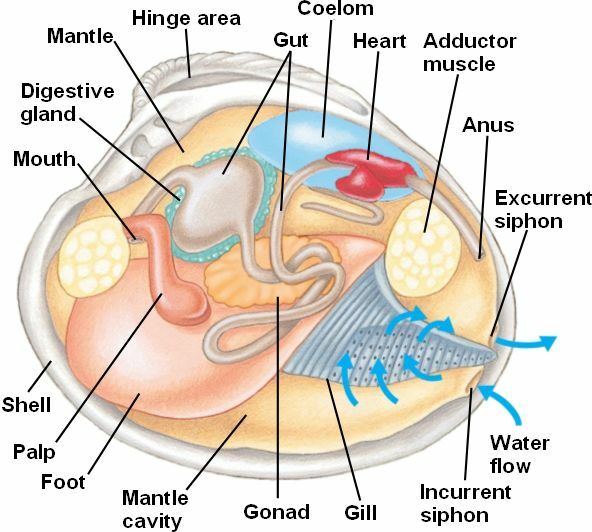 During the veliger stage, the body begins to take on a clam-like shape, where one side is straight (where the hinge will be), while the other is rounded (where the clam will ultimately open). After this phase, the creature has the typical bivalve appearance, with a hard shell and well-developed foot (and is called a pediveliger). Stiff and heavy, the juvenile sinks to the ocean floor (in what is called the settling stage). The total time to reach this juvenile phase is between 8 days and two weeks. As a young clam, he uses his foot to dig in the sand and move around (a bit), and a siphon that extends from the shell to feed. Many burrow under the sand with only the siphon extending up into the water to filter-feed on plankton. When above the sand, clams’ photoreceptors can distinguish when the shadow of a predator floats above, an event which often sends them diving for cover. There they wait until it’s spawning time again, and the life cycle repeats. 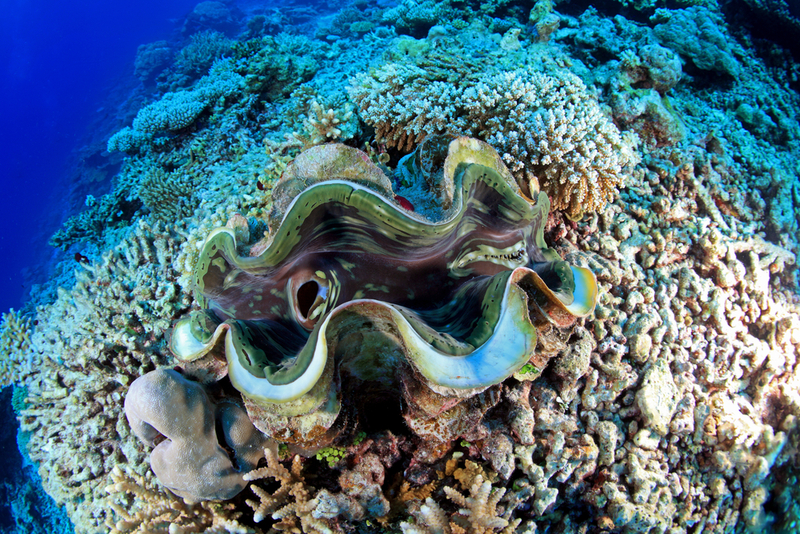 Only about 10% of fertilized eggs reach the juvenile stage, but if the clam is savvy (or just lucky) enough to avoid being eaten, it can live for about 30 years, grow up to 4 inches across and become a lady clam. How Do They Get the “Ms” on “M&Ms”? How Do the Ghosts in PAC-MAN Decide Where to Go? How are Baby Carrots Made? Why Don’t Vultures Get Sick When Eating Dead Things? In New Jersey, the minimum size for harvesting a clam (1.5 inches) is larger than they are as young juveniles (about 1 to 1.25 inches), which provides the species with enough protection so that the population has a little breathing room in which to reproduce. Only sea creatures that have scales are considered kosher, so Orthodox and Conservative Jews do not eat clams as they are among the foods listed as trayf (forbidden) by Jewish law. That said, many Reform Jews now consider the dietary laws (called kashrut) outdated and do not adhere to them. Islamic dietary laws are not so uniformly interpreted, and while some groups allow the consumption of clams (meaning they are permitted or halal) others prohibit it (considering clams haram). There is truth behind the adage, “never eat shellfish in a month that doesn’t have the letter R.,” since most shellfish poisonings occur in the summer, when bacteria and/or viruses are more likely to invade clams. Signs of shellfish poisoning, from eating contaminated clams or mussels, include nausea, vomiting, diarrhea, headache, dizziness and numbness or tingling in the mouth. On the other hand, unlike many large species of fish (like tuna and grouper), clams contain very little mercury (a contaminant found to affect brain and nervous system development), and even pregnant women may enjoy up to 12 ounces of clams each week. Live clams may be stored for up to 10 days, and they should be kept in a shallow dish covered with a damp towel (but not water until ready to use). Only eat clams that are alive immediately before preparation – ensure this by gently tapping any “open” clams on the counter. If they’re alive, they’ll close. Discard those that don’t. Clean the clams by first scrubbing away the grit from the shells. Lynn Rosetto Kasper of The Splendid Table next recommends submerging them in a bowl of ice water with 1 teaspoon of salt and 2 tablespoons of cornmeal for each quart of water, refrigerate them for 1 hour, then “drain, rinse and cook.” For this last, she also includes a recipe for Clams and Mussels in Garlic-Tomato Broth. If you prefer a little zing with your clam, check out this recipe for Linguisa Stuffed Quahogs from Chad’s Stuffed Quahogs in Falmouth (Cape Cod), Massachusetts. Is seafood Haram or Halal? Lobsters and crabs, halal or haram due to boiling alive?